Variable load spring supports are used for supporting pipe work, vessels, columns and pipe connections to large tanks, that are subject to thermal movement and/or subsidence. They are used when it is not possible to use rigid hangers and Constant load spring supports would be uneconomical. This full travel may be used providing the necessary calculations are carried out to ensure that the pipe work and nozzle connections can withstand the large changes that occur during pipe movement. Most international standards advise a maximum load variation of 25%, it is therefore recommended to select a variable effort spring support on this basis. Care should always be taken to ensure that the selected unit has sufficient travel available to permit the free vertical movement of the pipe when moving from the cold to hot position. Binder recommends that pipe load is correctly supported when the pipe is in its normal working position. This ensures that no abnormal or excessive forces is transferred to the pipe work in its stressed working condition due to out of balance supporting effort. The Binder Group manufactures four basic travel range units. These are BV35, BV70, BV140 and BV210 and have a maximum working range of 35mm, 70mm, 140mm and 210mm respectively. All units are easily adjusted, Types A, B, C and G being supplied with a Turnbuckle built into the unit. Type F,H & K units use a threaded load tube with a guided load column. Carbon Steel construction with Stainless Steel scale plate. Ideally suited for highly corrosive environments such as Offshore and Refining installations. Standard design allows surface protection system on all internal and external surfaces limiting potential corrosion. Scale plate fitted with a Hot/Operating (Red) and Cold/ Pre-Set (Blue) indicators. Compact design saving headroom, this is particularly important in Offshore applications where space is a premium. Load indicator visible from both sides of the unit. 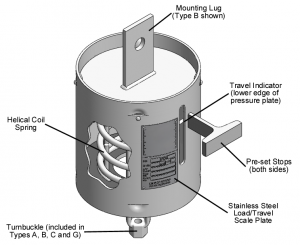 Spring pressure plate ensures the coil is always centred in the can. Every size has a reserve of travel at the upper and lower limits. Type F units supplied inclusive of load flange. Pre-Set Stops – The Binder units are supplied as standard with Pre-Set travel stops locking the unit in the cold position. If the unit is to be subject to a hydrostatic test load, this should be nominated at the time of ordering and a factory fitted hydrostatic test stop will be installed. Hydrostatic test stop allows up to twice the normal load to be applied during the test. Lifting lugs may be fitted if requested at time of order. Multi-Locks may be supplied if requested at time of order. These allow the support to be “locked” within the load range. Client nominated corrosion protection systems are available if required.